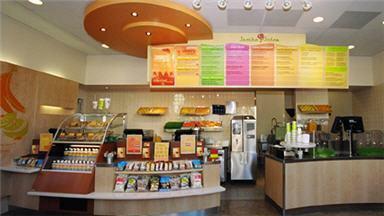 - Pure and simple ingredients - Delicious smoothies - Better-for-you foods Jamba Juice is a leading restaurant retailer of better-for-you food and beverage offerings, including great tasting fruit smoothies, juices, teas, hot oatmeal made with organic, steel cut oats, and baked goods. In a hurry? Participating stores also offer a range of delicious and simple Grab-n-Go food items, including a sandwich, salads and wraps. Like it hot? Dig in to one of our yummy California Flatbreads. And because everything's made with real, honest ingredients and no artificial preservatives and flavors and 0g trans fat, you're getting nothing but the good stuff. That's Jamba.